Residents of Sri Lankas eastern districts frequently spoke of government complicity in Karuna group abductions as an obvious fact. Tamils in Ampara, Batticaloa, and Trincomalee districts say they have seen Karuna members working with the army and police at checkpointsan allegation the government deniesand that armed Karuna cadre walk freely through villages and towns in areas under government control, sometimes wearing Sri Lankan army uniforms. Until mid-November 2006, the government denied any knowledge of abductions by the Karuna group. But the following, each already noted above, demonstrate that government officials must have known of the abductions, at least since the middle of June 2006, and probably before. In July a group of mothers from Batticaloa district submitted a petition to the Supreme Court about abductions allegedly by the Karuna group. The 48 mothers sent the names of their children with all relevant information about the abduction to President Rajapakse, the minister for disaster management and human rights, and the Human Rights Commission, as well as to the United Nations. In one of the most egregious reported cases of government complicity, local human rights activists and the mother of an abducted young man told Human Rights Watch that one child who escaped from a Karuna camp had gone to the Sri Lankan army for protection, but the soldiers handed him back to the Karuna group.53 Human Rights Watch did not independently verify this case. The main road from the eastern districts to the Welikanda area is firmly under government control and highly militarized. Transporting several hundred abducted boys and young men during the year to the Karuna camps would have been impossible without the knowledge of government security forces. Travel in the area requires going through numerous checkpoints of the army and police. 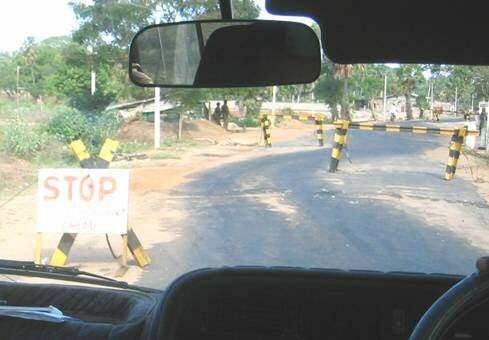 A security checkpoint on the A11 road between Batticaloa town and Valaichchenai. Karuna forces transporting abducted boys and young men would have had to pass through multiple checkpoints like this. Transporting abducted boys and young men from Ampara district would prove even harder. The coastal A4 road from Ampara to Batticaloa town has a strong presence of the police Special Task Force (STF). On October 17, Human Rights Watch observed three large STF camps along the route. Another place where parents have seen their abducted sons is the TMVP office in Batticaloa town. International aid agencies have also seen armed children on the premises. When Human Rights Watch walked by the office on October 16, it was guarded on three sides by the Sri Lankan police. International aid workers said that the police had been protecting the building since construction began in early 2006. Human Rights Watch also observed the TMVP office in Akkaraipattu, which was guarded by the STF. The TMVP office in Trincomalee was guarded by the navy. Government protection of the TMVP is understandable because party offices have come under repeated attack by the LTTE. But the presence of security forces around the buildings makes it highly unlikely that they failed to see abducted children on the premises. But residents in eastern districts routinely observed the close ties between government and Karuna forces. Staffers from two international agencies working in the eastern districts told Human Rights Watch that the easiest way for them to contact the Karuna group was through the Sri Lankan military. The Sri Lankan government is ultimately responsible for providing security to ensure that civilians are not abducted by armed groups and that children are not recruited, voluntarily or otherwise, to take part in armed conflict. This is particularly the case in areas under the governments effective control. The government security forces active in the eastern districts are the Sri Lankan army, the navy, the regular police, and the polices Special Task Force, which is engaged in counterinsurgency operations. Unless stated otherwise, officers noted below were, according to the information available, in command during Human Rights Watchs visit in October 2006. In Batticaloa district responsibility for security is primarily with the army, which maintains a network of outposts and camps. Three army brigades operate in the district: The 231 brigade, commanded by Colonel Veeraman, is responsible for the districts west. The 232 brigade, commanded by Colonel Napagoda, is responsible for the north.57 The 233 brigade, commanded by Lt. Col. Anura Sudasingha, is in Batticaloa town. All of the Batticaloa brigades report to the armys 23rd division headquartered in Welikanda, commanded by Brigadier Daya Ratnayaka. For most of 2006, Commander of Security Forces Headquarters-East was Major General Nissanka Wijesinghe. In late December he was replaced by Major General Parakrama Pannipitiya. In Trincomalee district, the armys 22nd division has official responsibility, commanded by Maj. Gen. Samarasinghe. Trincomalee has a large navy presence because of its major naval base, and knowledgeable sources say that Navy Commander Rear Admiral Samirathunga is the de facto commander. President Rajapakse is the commander-in-chief of Sri Lankas armed forces, and he holds the portfolio of Minister of Defense. The Secretary of Defense, Public Security, Law and Order is the presidents brother, Gotabaya Rajapakse.58 Chief of the Defense Staff is Air Chief Marshal Donald Perera. Commander of the army, since December 6, 2005, is Lieutenant General Sarath Fonseka. In Ampara, Batticaloa, and Trincomalee districts the STF also plays an important role, especially since July 2006 when the military mobilized for the fighting further north.59 Around that time the STF assumed security responsibility for Batticaloa town. It remains unclear who are the leaders of the Karuna group in the eastern districts. According to the parents of abductees, local human rights activists, and international aid workers, the TMVP political leader for Ampara and Batticaloa is a man named Pradipan, who runs the office in Batticaloa town. Another leader mentioned is a man called Mangalan. In Akkaraipattu, the TMVP office is run by a man named Sindujan. A man named Bharathy has been implicated in conscription by the Karuna group in Welikanda. In early November 2006, a special advisor to the UN special representative for children and armed conflict, Allan Rock, visited Sri Lanka to investigate conditions for children, primarily in the north and east. He focused on compliance with the 2003 Action Plan for Children Affected by Conflict, which the Sri Lankan government and the LTTE had endorsed. Both sides had pledged to work with UNICEF to end child recruitment and to release children in their ranks. Rock also criticized the Karuna group for continuing to abduct and recruit children, particularly in Batticaloa district. Between May and November 2006, he said, UNICEF has recorded 135 cases of underage recruitment, and the evidence suggested the trend was on the rise. [F]ound strong and credible evidence that certain elements of the government security forces are supporting and sometimes participating in the abductions and forced recruitment of children by the Karuna faction. Rock announced that the Karuna group and the Sri Lankan government had responded constructively to the allegations. The TMVP told him it would forbid underage recruitment and release any children in the Karuna group. The party also agreed to work with UNICEF to arrange the release of abducted children. The governments public expressions of surprise were disingenuous. As documented above, the government knew of Karuna abductions since at least June 2006. Parents of abducted children were reporting their cases to the police, and in some cases to the military. Both failed to take any meaningful steps to get the children back. He said the minimum age to join the Karuna group was 20, and that the group would take action against any commander who recruited a person below that age. We would send him out of the movement, he said. 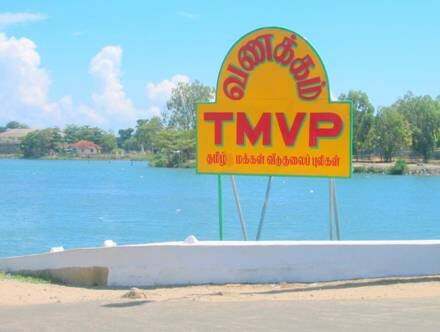 This sign of Karunas TMVP political party stands in the center of Batticaloa town. Parents told Human Rights Watch they saw their abducted children in the local TMVP office. Karuna said his forces had a code of conduct. He agreed to share a copy with Human Rights Watch but, as of January 15, 2007, the group had not sent any text. According to Karuna, the TMVP has 16 political offices throughout Sri Lanka. When asked why families had seen their abducted children in TMVP offices, he replied, Anybody can come and see our offices. It is very transparent, like an MPs [Member of Parliaments] office. He continued, Definitely there are no underage children in our political offices. Anyone can come and inspect. He attributed the reports of abductions by the Karuna group to the LTTE and their supporters. All these things are propaganda campaigns by the LTTE and the diaspora, he said. 1. Re-issue a policy statement to inform all Karuna commanders that using and recruiting children is not an acceptable practice. 2. Train all commanders on childrens rights with assistance from the international community. 3. Release to their families children who may be found among Karuna ranks, in collaboration with nongovernmental organizations and/or UNICEF. On January 2, 2007 the TMVP provided UNICEF with what it called regulations for the military division of Thamil Makkal Viduthalai Pulikal (TMVP). (See Appendix V.) The regulations state that all recruits must be over 18, provide a birth certificate to prove their age, and consent to join the military group. The regulations state that members of the Karuna group who conscript children into the force will be immediately subjected to punishment. Examples specified include cooking in the camp or farming for a period of at least three months. In contrast, the regulations state that violations such as murder, sexual abuse, and looting will result in the member being removed from the organization and handed over to the police. Violations such as smoking, consuming liquor, and the abuse of women result in expulsion from the organization. According to UNICEF, parents and others reported 21­­ abductions by the Karuna group in November, and another eight in December. The group released four children in November and two in December.80 The UNICEF statistics do not specify whether any of the November abductions took place after November 13, when the UN made its allegations against the Karuna group and government security forces. According to human rights activists and aid agencies working in the eastern districts, however, some abductions took place in the second half of the month. On November 21, Human Rights Watch wrote to President Rajapakse and to the minister for disaster management and human rights to convey the organizations initial findings on Karuna abductions and government complicity from the research mission in October (see Appendix I). The letter welcomed the presidents stated willingness to investigate the allegations of state involvement and asked the president to provide details on how that investigation would be pursued. The letter was resent in early December. As of January 15, 2007, neither the presidents office nor the human rights ministry had replied. 46 Namini Wijedasa, UNs Allan Rock Ridiculed in Sri Lanka, Toronto Star, November 23, 2006. SLMM confirmed for Human Rights Watch that it had prepared the report but said its contents were not public. (E-mail communication from SLMM to Human Rights Watch, December 27, 2006). 47 Human Rights Watch interview with international aid agency staff member, Batticaloa town, October 2006. 48 UNICEF Condemns Abduction and Recruitment of Sri Lankan Children by the Karuna Group, UNICEF news note, June 22, 2006, http://www.unicef.org/infobycountry/media_34677.html (accessed January 9, 2007). 49 Human Rights Watch interview with Minister of Disaster Management and Human Rights Mahinda Samarasinghe, Geneva, December 1, 2006. 50 Namini Wijedasa, Tiger Pledge on Child Recruits no HonouredHuman Rights Minister, The Island (Colombo), January 14, 2007. 51 Human Rights Watch interview with mother of abducted boy, Batticaloa district, October 2006. 52 Human Rights Watch interview with mother of abducted young man, Batticaloa district, October 2006. 53 Human Rights Watch interview with mother of abducted young man, Batticaloa district, October 2006. 54 Human Rights Watch interview with international aid agency staff member, Batticaloa town, October 2006. 55 Anthony Deutsch, Government-condoned Militia Abducting Hundreds on Sri Lankas East Coast, Associated Press, October 4, 2006. 56 Human Rights Watch telephone interview with V. Muralitharan, a.k.a. Colonel Karuna, November 29, 2006. 57 Col. Napagoda commanded the 232 brigade at least since July 2006 (see Sri Lanka: ICRC Hands Over Soldiers Remains to the Sri Lankan Army, ICRC press release, July 15, 2006, http://www.icrc.org/web/eng/siteeng0.nsf/html/srilanka-regnews-150706 (accessed January 9, 2007)). His predecessor was Col. Chandana Rupasinghe, but it is not known when he left the post. 58 Gotabaya Rajapakse is a retired army infantry officer. He became minister of defense, public security, law and order in November 2005. On December 1, 2006 he survived an LTTE suicide attack on his convoy in Colombo. 59 For official background on the STF, see http://www.police.lk/divisions/stf.html (accessed January 9, 2007). 60 Statement from the Special Advisor on Children and Armed Conflict, Colombo, November 13, 2006, http://www.un.org/children/conflict/pr/2006-11-13statementfromthe127.html (accessed January 9, 2007). 63 Namini Wijedasa, UNs Allan Rock Ridiculed in Sri Lanka, Toronto Star, November 23, 2006. 64 Watch Your Words, Mr. Rock, Daily News (Colombo), November 15, 2006, http://www.dailynews.lk/2001/pix/PrintPage.asp?REF=/2006/11/15/main_Editorial.asp (accessed January 2, 2007). 65 Krishan Francis, U.N. Accuses Sri Lanka Government Forces of Aiding Child Soldier Recruitment, Associated Press, November 13, 2006. 66 Who is this Rock?, Media Centre for National Security, December 5, 2006, http://www.nationalsecurity.lk/fullnews.php?id=2665 (accessed January 3, 2007). 67 UN Rock Repeats Tiger AccusationsKaruna Group, Asian Tribune, November 16, 2006, http://www.asiantribune.com/index.php?q=node/3241 (accessed January 2, 2007). 68 Human Rights Watch interview with Minister of Disaster Management and Human Rights Mahinda Samarasinghe, Geneva, December 1, 2006. 69 Personal communication from Allan Rock to Human Rights Watch, January 16, 2007. 70 Sri Lanka: Stop Child Abductions by Karuna Group, Human Rights Watch news release, November 28, 2006, http://hrw.org/english/docs/2006/11/28/slanka14678.htm. 71 Rights Group Criticizes S. Lanka over Child Soldiers, Reuters, November 28, 2006. See also Krishan Francis, Rights Group Asks Sri Lankan Troops to Stop Aiding Child Recruitment, Associated Press, November 28, 2006. 72 Human Rights Watch telephone interview with V. Muralitharan, a.k.a. Colonel Karuna, November 29, 2006. 73 Ranga Jayasuriya, Who Manipulated the UN Envoy? Sunday Observer (Colombo), November 19, 2006, http://www.sundayobserver.lk/2006/11/19/fea02.asp (accessed January 9, 2007). 74 Report of the Secretary-General on children and armed conflict, October 26, 2006, S/2006/826, http://daccessdds.un.org/doc/UNDOC/GEN/N06/577/95/PDF/N0657795.pdf?OpenElement (accessed January 5, 2007). 75 Karuna Commits to Work with the UN to Prevent Recruitment and Use of Children, Office of the Special Representative of the Secretary-General for Children and Armed Conflict press release, December 4, 2006, http://www.un.org/children/conflict/pr/2006-12-07srilankakarunaco134.html (accessed January 3, 2007). 78 Data supplied to Human Rights Watch by UNICEF, January 12, 2007. 79 Sri Lanka Monitoring Mission, SLMM Weekly Situation Report, 20-26 November 2006, http://www.slmm.lk/W_Report/SLMM%20WSR%2020%20-%2026%20Nov%20public.pdf (accessed January 3, 2007). The SLMM reported in its weekly situation report for December 4-10, 2006 that it was aware of 12 abductions in Batticaloa, several of which were of children, but the report did not indicate the responsible party. 80 Data supplied to Human Rights Watch by UNICEF, January 12, 2007. 81 University Teachers for Human Rights (Jaffna) communication to Human Rights Watch, December 20, 2006. For more from UTHR, see www.uthr.org.